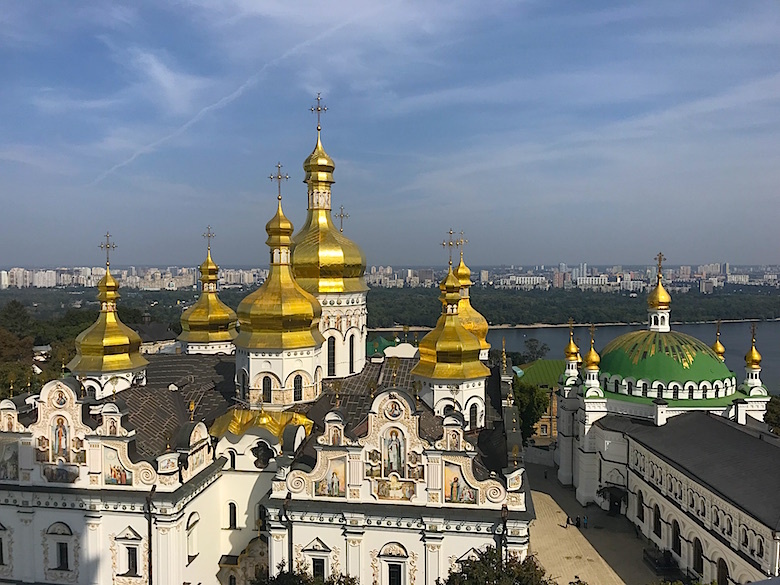 Without a doubt, the Monastery of the Caves is the most beautiful sight in Kiev. It is the emblem in the Russian Orthodox world and is classified by the UNESCO as a World Heritage Site. The monastic complex gathers several beautiful churches, some museums and the famous underground caves. The monastery is more than just a tourist place. It is a world-famous place for Orthodox Christians that flock here on religious pilgrimage. They visit the caves to pray in front of the remains of mummified monks. To enter the caves you need to buy a candle as there is no light in the caves. Even if the caves can be crowded, it is a unique and mystical experience to discover them with a candle in your hand. The St. Sophia Cathedral in Kiev is considered an absolute masterpiece of Christian art in Europe. While the outer walls of the cathedral were heavily damaged and rebuilt, the magnificent Byzantine interior of the 11th-century cathedral has largely been preserved. 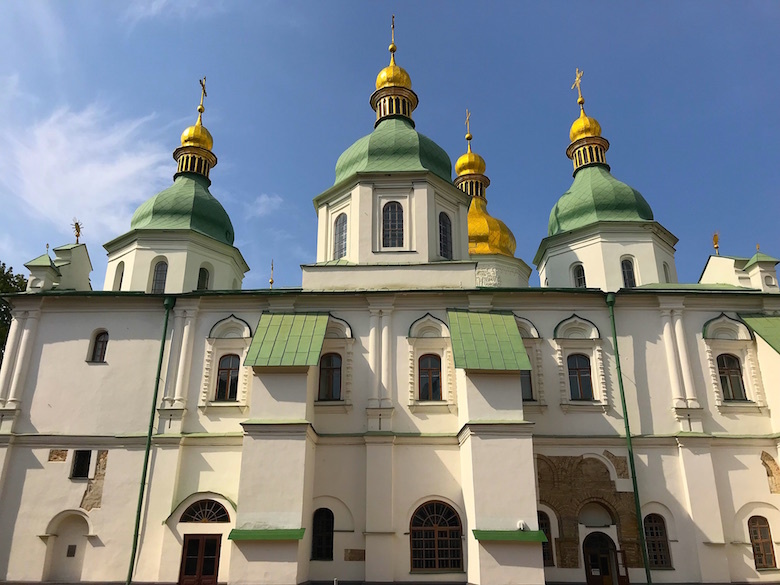 With its magnificent seven domes and five-nave interior, it served as the main cathedral of Kievan Rus, a great empire that is now considered the predecessor of the states of Russia, Belarus and Ukraine. 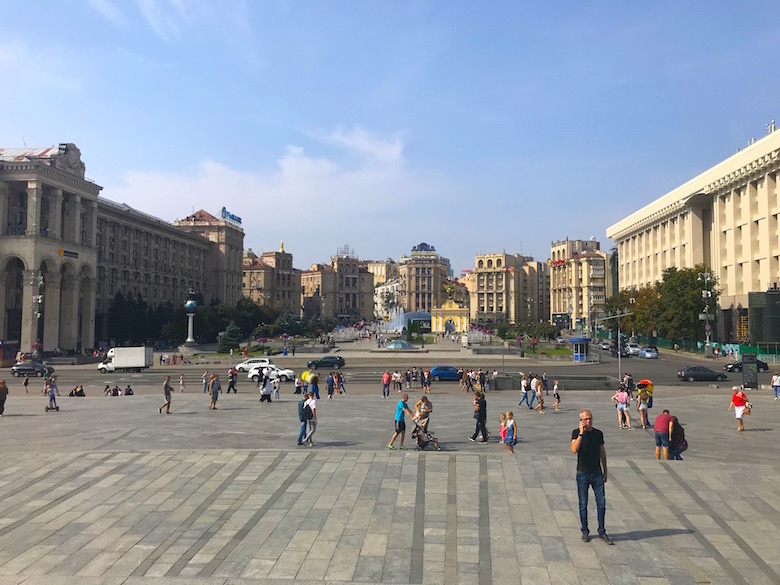 Maidan Nezalezhnosti (Independence Square) is the most popular square in Kiev. The central square consists of a large column and is bordered by “Stalinist” style buildings. The Maidan became world famous in 2004 when the Orange Revolution took place. 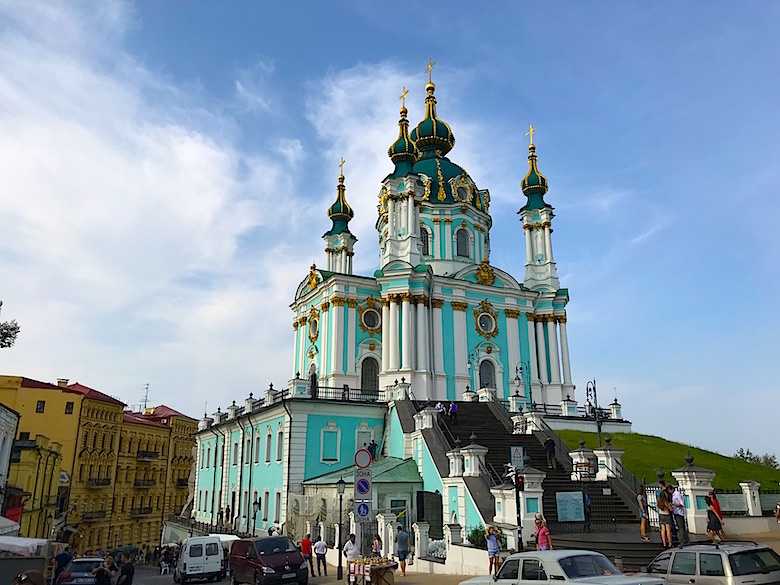 Built in the 12th century, the St. Michael’s Golden-Domed Monastery is one of the jewels of Kiev. Destroyed by the Soviets, it was completely rebuilt identically after Ukraine gained its independence. 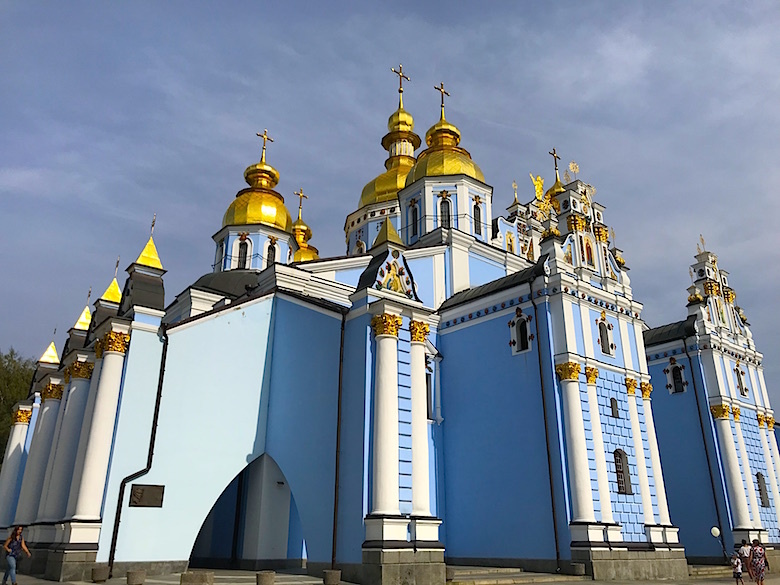 Today the monastery is the seat of the Patriarchate of the Ukrainian Orthodox Church. A high place of religious fervor. 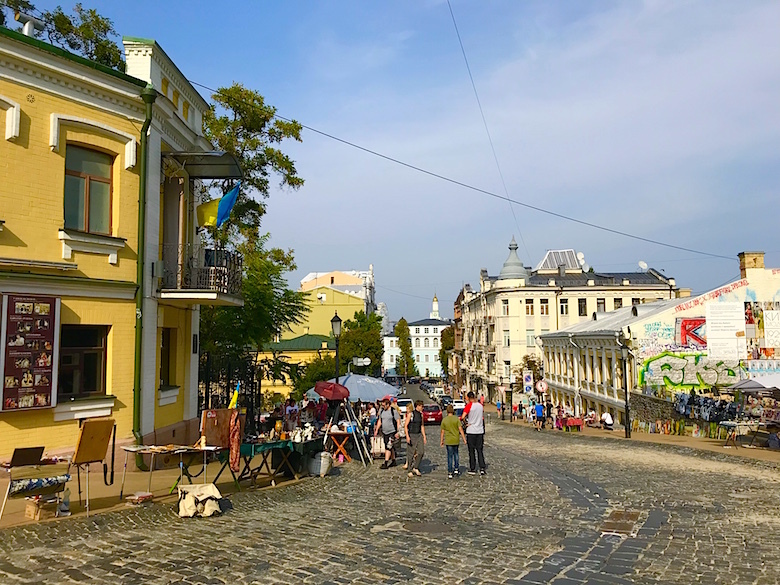 The Andriyivsky Descent, whose literal translation is the descent of St. Andrew, is one of the most visited streets in Kiev. The street starts at the top with a small souvenir market and the magnificent St. Andrew’s Church. It continues with a few bars and cafes, as well as the Mikhail Bulgakov Museum and the Kyiv Academic Theatre of “The Wheel”. At the end you will find a great 15 meters high grafitti drawn on a housewall, that is called “Revival of Ukraine”. If you are looking for souvenirs, then Andriyivsky Descent is the place to be. Saint Andrew’s Church is a masterpiece of Rococo art and was built in 1755 by the Italian architect Francesco Rastrelli. Inside the church, the baroque pulpit is worth mentioning, as it is an absolute rarity in Christian Orthodox churches. 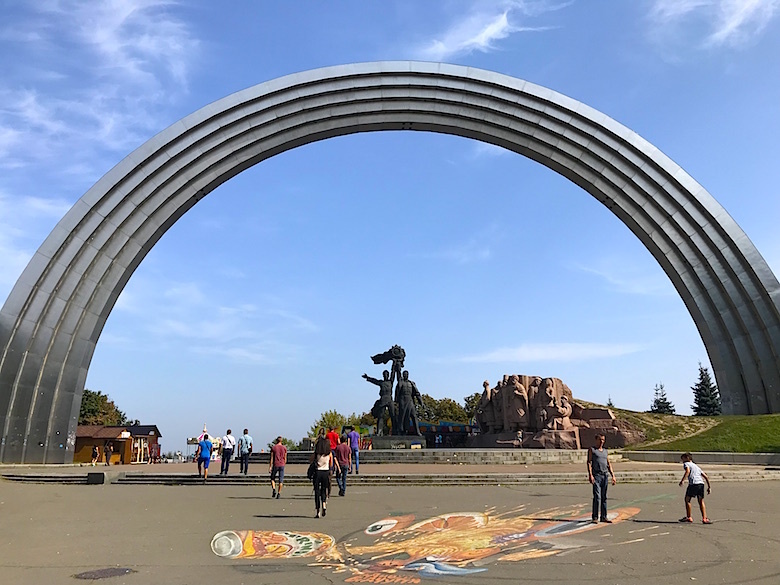 The People’s Friendship Arch was built between 1978 and 1982 during the Soviet Union in preparation for the 1500th anniversary of Kiev. It commemorates with three monuments the friendship between the Ukrainians and Russians. The largest monument is the Arch of Friendship, which represents a rainbow with a diameter of 60 meters. The second monument is the Pereyaslav monument carved out of granite and reminiscent of the Treaty of Pereyaslav in 1654. The third monument is a six meter high bronze sculpture. It represents a Russian and a Ukrainian worker who hold up the Soviet Order of Friendship of Peoples.